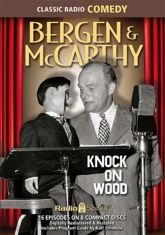 The impeccably dressed Charlie McCarthy was as sarcastic as he was stylish. His country cousin Mortimer Snerd was buck-toothed, bucolic�and just as fondly remembered. But it was the egalitarian and exquisitely entertaining Edgar Bergen who brought them to life. Enjoy this Peabody Award winning team in 16 digitally restored and remastered episodes - many of which have not been available since their original broadcast in 1942! Hear performances by Rita Hayworth, W. C. Fields, Harold Peary, Hedy Lamarr, Don Ameche, Dale Evans and more.